Why People Believe in God? This website is dedicated to the study of the religious experience. 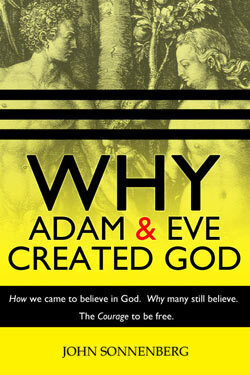 Why Adam and Eve Created God by John Sonnenberg is the culmination of many years of research into this topic. It answers the question: Where did God come from? This web site allows you to preview and obtain the book, read additional related material, and comment on the topic. Well, its probably not your fault or even your own doing. There are so many reasons people believe in God, most all of which are completely understandable and normal. And none of which have anything to do with supernatural events, divine interventions, revelations from heaven or the work of a diety. So why do people beleive? The question perplexes many, yet is so simple to answer. To see the answer, we must just step back and look at our world. If we ask a thousand people that question, we get a thousand different answers. But when we look at the distribution of people holding various beliefs, the answer jumps out at us. 95% of people born in Ecuador are Catholic, 97% of people born in Finland are Lutheran, 97% of people born in Greece are Greek Orthodox, 99% of people born in Tunisia are Muslim, 93% of people born in Iran are Shi’a Moslem, and 83% of people born in Israel are Jewish. Therein lies the answer! If you live in Ecuador, you would probably be Catholic. Why? Your parents, their friends, and the society all hold Catholic beliefs, and this is what you grew up with. Being Catholic seems totally natural, and you probably wonder why all people aren’t Catholic. Further reinforcing your convictions are the emotions and psychological reactions you feel when considering other religions, or doubting your own. Denying your faith would mean denying your parents, friends, and even denying your country. But there is so much more to it than history. We are a race of believers ready to embrace ideas that meet our many needs. Why do people believe? It is a fascinating question, and looking back at mankind’s rich history of outlandish beliefs can be quite entertaining. For some, it can be a bit painful. This book illustrates the origins of religious beliefs and why they perpetuate even today. It looks at the history of religious thought, and the evolution of various religious ideas. You will see why intelligent people will believe not just in Gods and the supernatural, but often believe in completely outrageous ideas. With history as a backdrop, this book delves into the wide array of emotional, social, intellectual, and psychological factors that made ancient people create God and still cause the majority of us to believe in those gods. Religions with very contradictory ideas are found all around the globe, which show us that the actual teachings of a religion are not all that important. Ideas are not why people believe. All the other factors are. This book develops a clear picture of what religious belief really is, encouraging you to break down the barriers it places around your mind, your life, and your society. I hope we can help build a society that is inspired by love, not fear, where people are encouraged to use clear-thinking intelligence when making judgments, to doubt bad ideas, to trust themselves instead of a god, and to judge virtues and sins with regard to their effects. Then we can build a community far more harmonious than any religion has ever accomplished.